Rubber Jellyfish is making a difference! Rubber Jellyfish was released theatrically on September 26, 2018. Since then, momentum and enthusiasm for the project has been steadily growing. People walk away from our screenings feeling motivated to help spread the word about the environmental damage caused by balloons and dispel the mythology that latex balloons are “environmentally friendly”. The film has also attracted quite a lot of media attention, click here to view some examples of Rubber Jellyfish in the press. Here is a list of some of the positive changes the film has inspired so far (in order of the most recent). The host of our first American Rubber Jellyfish screening managed to avert a balloon release that was planned to follow the memorial for a young man who had tragically passed away. We are grateful for the compassionate, non-judgemental but informative approach this retired school teacher turned RJ screening host used to avert this polluting event! A member of Sea Shepherd learned about this planned release (which was widely advertised as the finale event at a charity fundraiser) and worked with Boycott Balloons Fremantle to avert the release. BBF mentioned Rubber Jellyfish in their discussions with the organisers that lead to the release being canceled. We do not know how many balloons were planned to be released but we do know that every attendee was to be given a balloon and the founder of Boycott Balloons Fremantle was informed by one of their organisers that they saved hundreds of dollars by deciding not to go through with the release. Well done!! Ray White (the largest real estate company in Australasia)’s Corporate HQ stopped manufacturing branded balloons which previously were available for order by all Ray White franchises. 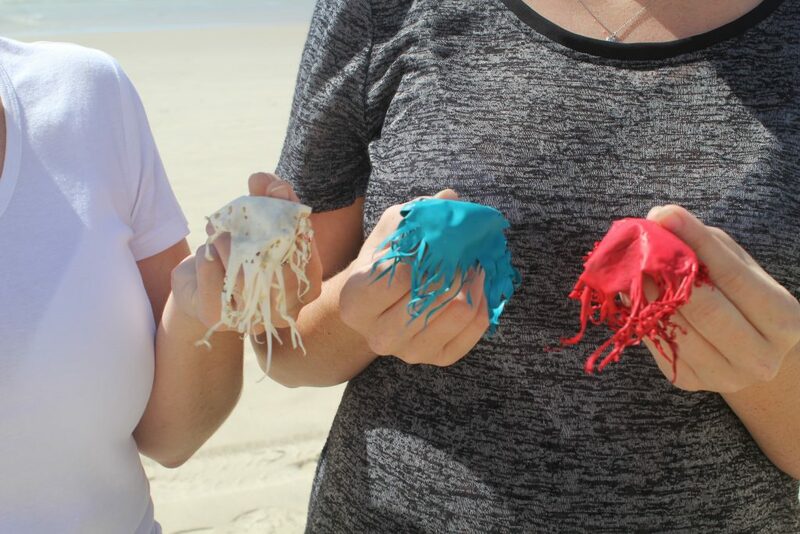 This happened as a result of the RJ film maker emailing the real estate conglomerate a balloon in the jellyfish shape with a Ray White logo that was found on a sea turtle nesting beach by volunteers of a sea turtles rescue group in Sunshine Coast, Queensland. Prior to this, Ray White franchises ordered roughly 30,000 balloons a year. This story is part of the documentary. September, 2017: Bainbridge Island (a bedroom community near Seattle) banned the release of balloons. This occurred as a result of a council member viewing the Rubber Jellyfish trailer prior to release of the film. Balloon release ceremonies can often be averted when someone mentions to the organisers that they are extremely environmentally hazardous. Usually the organisers of these events are under the false impression that latex balloons are “environmentally friendly” and simply need to be informed that this is not accurate. Feel free to contact us for support in averting a balloon release ceremony. By far, the greatest thing you can do to put an end to the balloon madness is to simply never purchase a balloon and help spread the word about the dangers of balloon release ceremonies. Environmental organisations often hold community beach cleanups. If you have an opportunity to attend one, or to organise one, please do! Magic happens when people view this film on the big screen, in the company of like minded souls. Click here to see if there is a screening planned near you or to volunteer to host one if there isn’t. The film maker and Rubber Jellyfish protagonist Carly is working with the Queensland University of Technology on a slate of educational materials to accompany the film as part of a PhD dissertation on impact strategies for environmental documentaries. These educational materials will be available, once complete, to schools who have purchased a Rubber Jellyfish education licence. School libraries often have a budget for acquiring educational licenses for documentary films. If you have a school aged child or are affiliated with an educational institution, you may suggest the school purchase an educational license to screen the film and allow students to download it. As with all environmental and social issues, it is important to make your elected officials aware of your concerns. We strongly encourage community groups, environmental organisations, and individuals to hold letter writing sessions in support of bans on balloon release ceremonies – particularly if you become aware of a planed release. Rubber Jellyfish is registered with the Documentary Australia Foundation. Donations made to the film at this stage will be used in our education and outreach strategy. Stay tuned to film updates and news surrounding this issue through Facebook and Instagram. The film maker (Carly) can also be followed on Facebook, Twitter, and Instagram. Feel free to save this photo to your computer or phone and share it on your social media channels or share it directly from our Facebook page.